They stole it from us. Sneaky little hobbitses. Wicked, tricksy, false! It can’t have escaped your notice that there is a film from New Zealand out today that people are quite interested in. It’s certainly inescapable here in Wellington, as you can see from this shot I took in Wellington Airport on my way to South Island last week. Anyway, the spectacular scenery of New Zealand’s South Island does more than provide stunning wide angle shots for Peter Jackson to use in his films, it provides a home for many great species of bird (not to mention also provide some of the finest walking country in the world). 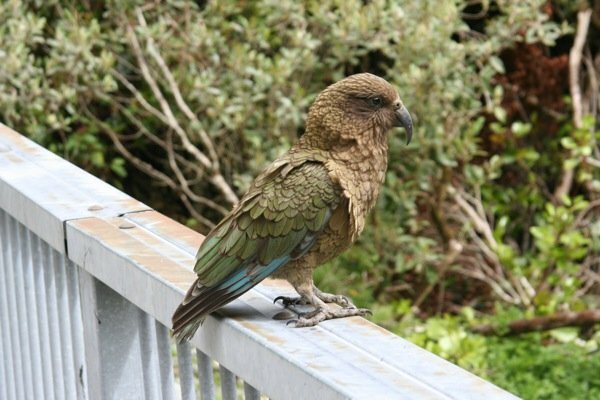 One such bird that is a popular fixture of the Southern Alps, liable to be found wherever unwary tourists may have left an unattended sandwich, or for that matter, an unattended car, or even an attended car, is the Kea. 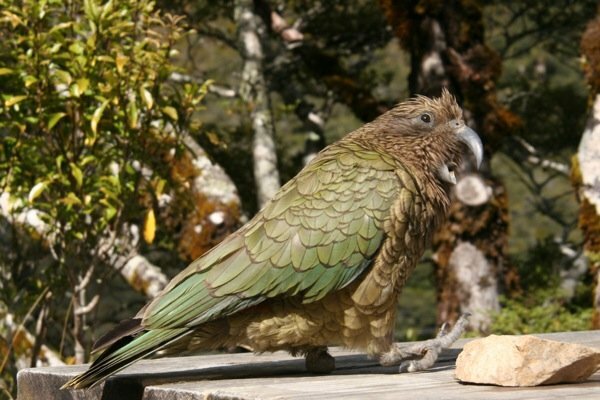 Kea are a species of alpine parrot endemic to New Zealand. They are famous for any number of reasons, most of which stem from their innate intelligence and curiosity. They are excellent opportunists, and have developed a taste for meat to an extent almost unrivalled in the parrot order. For many years they were persecuted by farmers for preying on sheep, but in fact they will indeed do just that if they can. That bill isn’t just for nuts. 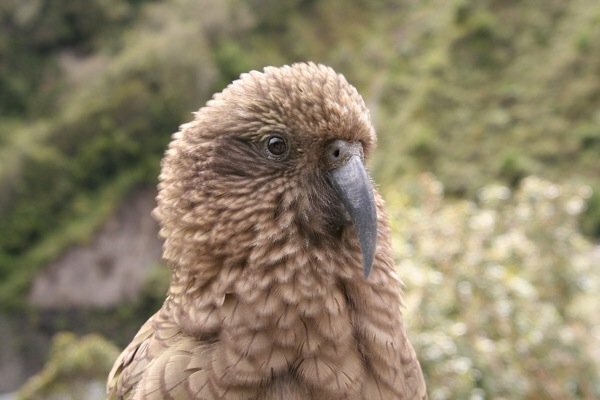 Kea are extremely curious birds, and investigate just about anything with their bills. This has actually turned out to be a problem where young birds have chewed on lead nails in country buildings in the vague hope they might turn aout to be edible! 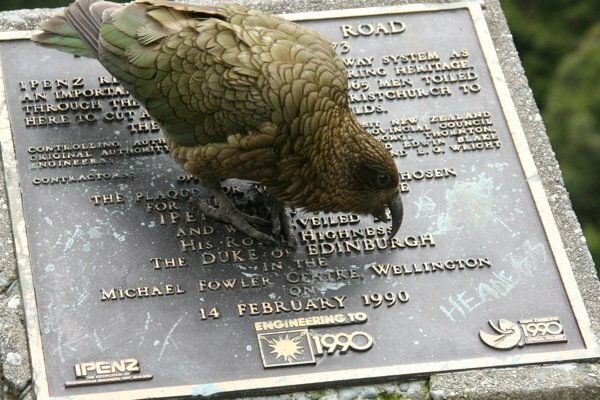 DOC is currently working to take the nails away from prying beaks, but Kea are famous for chewing on cars of tourists, among other things. This wasn’t edible last time, but you never know. 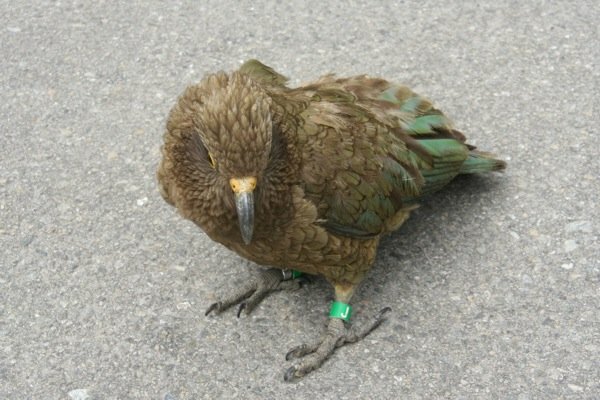 This Kea is missing a foot, yet seems to cope out in the wild. Click to enbiggen. 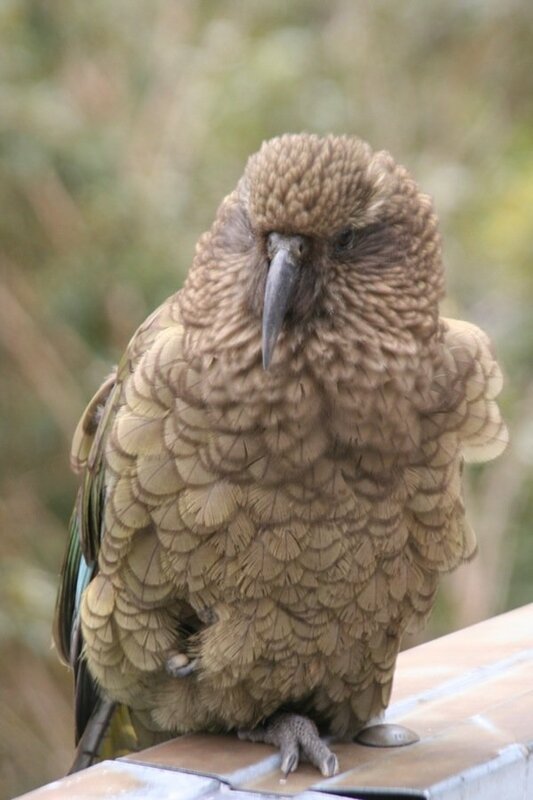 Young Kea have yellow around the eyes and the nares. 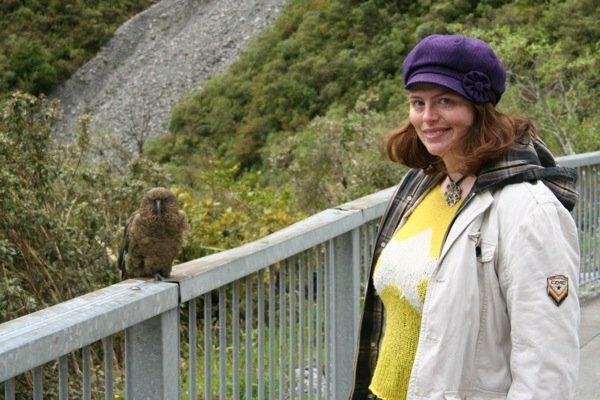 My friend Alice was very happy to see her first Kea, but this one was channeling the bored look of an owl. Alice wasn’t feeding him, he wasn’t interested. 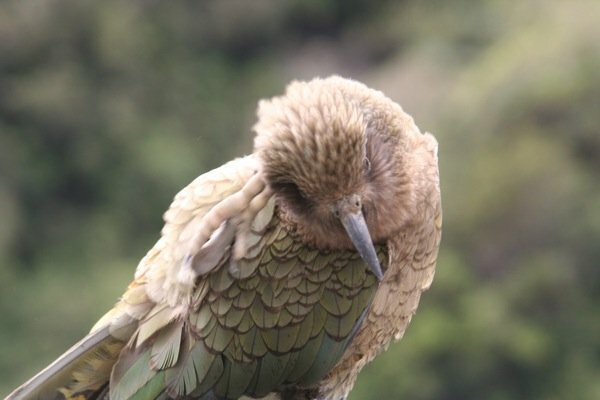 Hint – do not feed Kea. It is bad for them. While this may look idilic, this adult was actually on their way to administer a beating to a youngster. 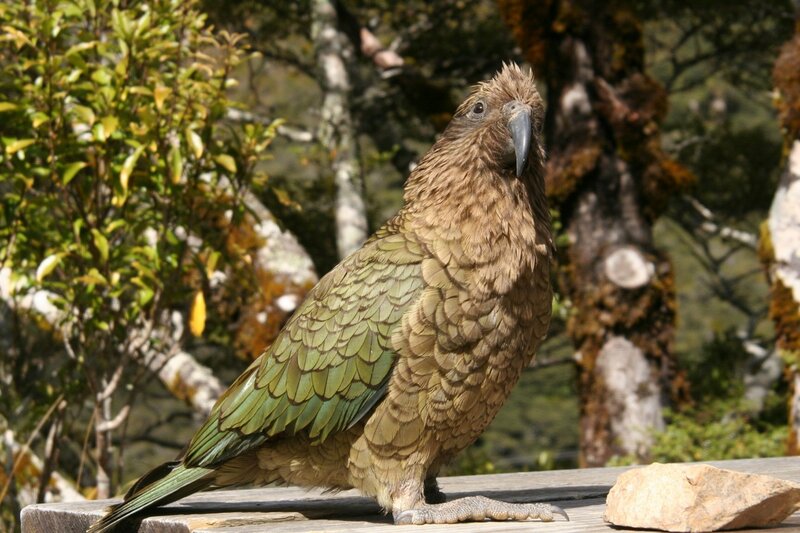 While Kea are hardly challenging as birds go to locate, they should remain a highlight for any visitor to New Zealand by sheer force of personality. 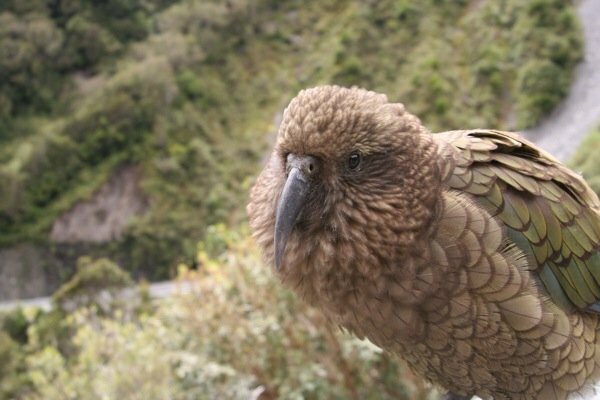 They have certainly won over New Zealand, which regards them with a slightly bemused pride as one of the world’s most unusual parrots. So as you watch the Hobbit, and think about coming here to see the wild land in the flesh, think about the parrots that will liberate your lunch, and your wallet, while you do so. They make it that much more fun! 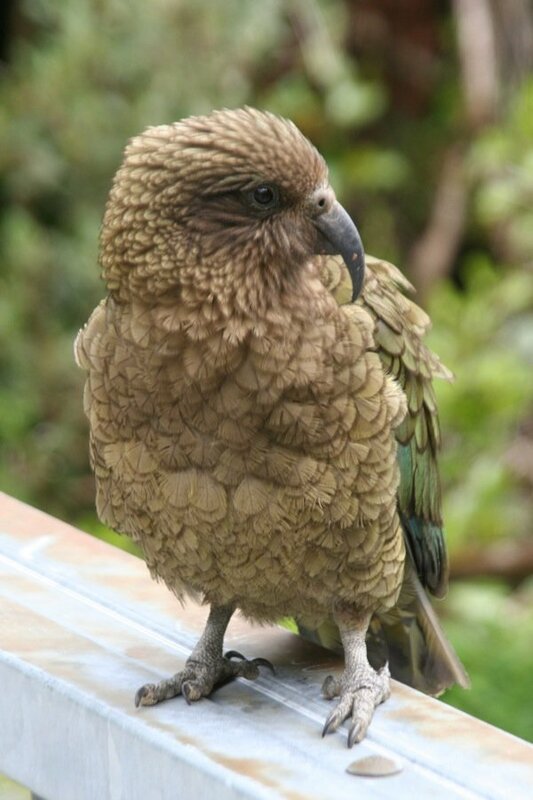 New Zealand has some really cool parrots. I would love to see them some day. “While this may look idilic, this adult was actually on their way to administer a beating to a youngster.” may be the greatest photo caption in 10000birds history. With “Click to enbiggen” as a close second. Did you make this word up to make us smile or is it truly a New Zealandism? 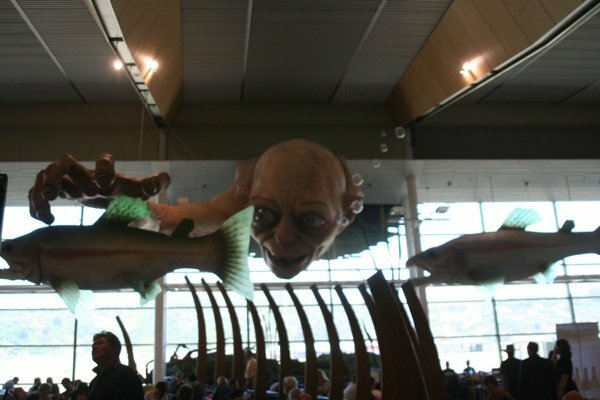 Loved this blog and can’t wait to see NZ scenery in The Hobbit! These are a wonderful series of photos! 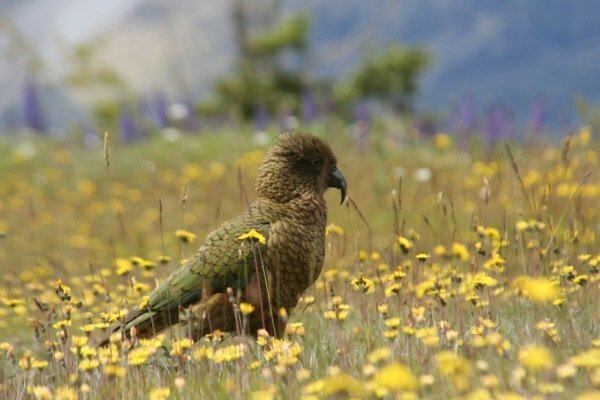 I loved seeing the Kea in all its different “habitats”!